On Dec. 16, 2014, the people and seafood industry of Bristol Bay, Alaska, won the protection they had been seeking for decades for their local fisheries. President Barack Obama removed Bristol Bay from future oil and gas development through the Outer Continental Shelf Lands Act. Bounded by the Aleutian Islands to the south and opening into the Bering Sea to the west, the protected area stretches over 52,000 square miles, roughly the size of Florida. Bristol Bay is at the heart of one of the most productive fishing grounds in the country. The world’s largest wild sockeye salmon run funnels into the bay and its nearby rivers every year. Millions of seabirds and 25 species of marine mammals depend on the rich marine life of Bristol Bay. The region’s thriving commercial fishing industry, tribes, subsistence fishers, and conservation groups, including Pew, have worked together for years to win protection for this global example of sustainable fishing. The Bristol Bay region is an incredibly valuable ecosystem that supplies nearly 50 percent of the U.S.'s wild-caught seafood and supports thousands of fisheries jobs. Learn more about one of the richest U.S. marine ecosystems, its diverse wildlife, and its world-class commercial and subsistence fisheries. 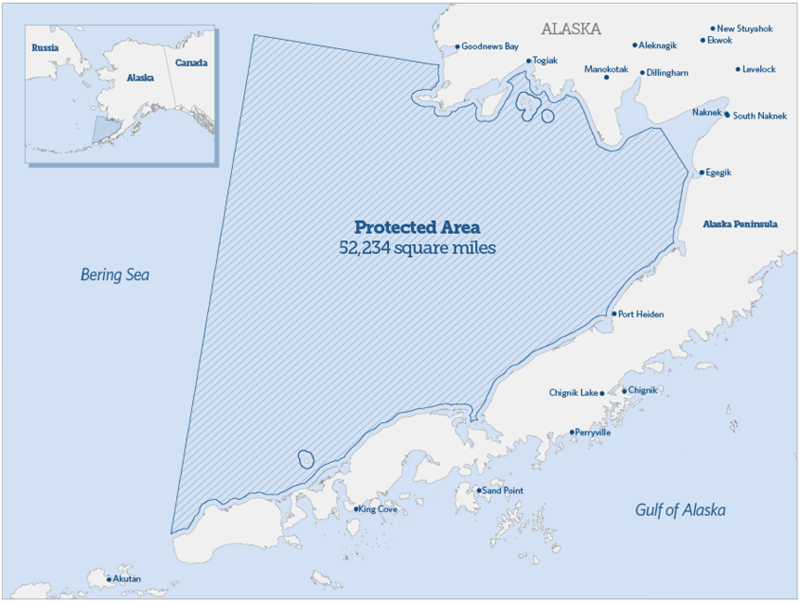 WASHINGTON —The Pew Charitable Trusts applauds today’s decision by the Obama administration to protect Bristol Bay, Alaska, one of the most productive fishing grounds in the nation.